Torch Password Recovery is a portable and unique browser that offers you powerful browsing with built-in media downloading and sharing features. Like most of the browsers, it also helps you to remember your website login passwords and stores it in encrypted storage. 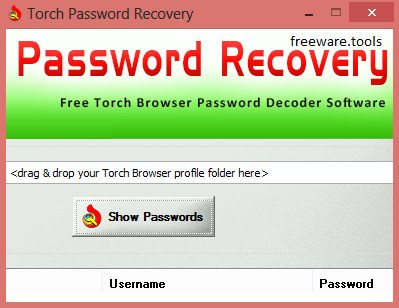 Torch Password Recovery Tool helps you to quickly & easily recover all these website login passwords stored by Torch browser. You can also save all the recovered password list to HTML/XML/TEXT/CSV file for future use. Given this tool is a portable edition, no installation is required to use it. Torch Password Recovery is a straightforward and easy to handle application that was created to serve as a means of recovering lost or forgotten access credentials for various online accounts, sparing you from having to reset them. As a means of saving you time and effort, the utility does not require installation and can be launched as soon as you download and decompress its archive. Consequently, this translates into the possibility of storing and running Portable Torch Password Recovery from a removable memory device, such as a thumb drive. Once you are done, you can remove it without leaving traces of it on the host computer. The program’s method of functioning consists of locating the AppData file containing the login information that you have entered in the past, when accessing various websites via Torch Browser. Its location should be automatically detected, but you also have the option of manually defining it. To reveal the discovered credentials, you need only click on ‘Show Passwords’ and the tool will display the website, the username and the password in just a few instants, allowing you to view,and even save them to a TXT, HTML, XML or CSV report. Torch Password Recovery targets memorized passwords, so it is not likely that you will be able to recover your account details if you did not choose to allow the browser to remember them. All in all, Portable Torch Password Recovery proves to be a useful and simple to understand piece of software which you can resort to whenever you need to retrieve lost or forgotten login details from your favorite browser.